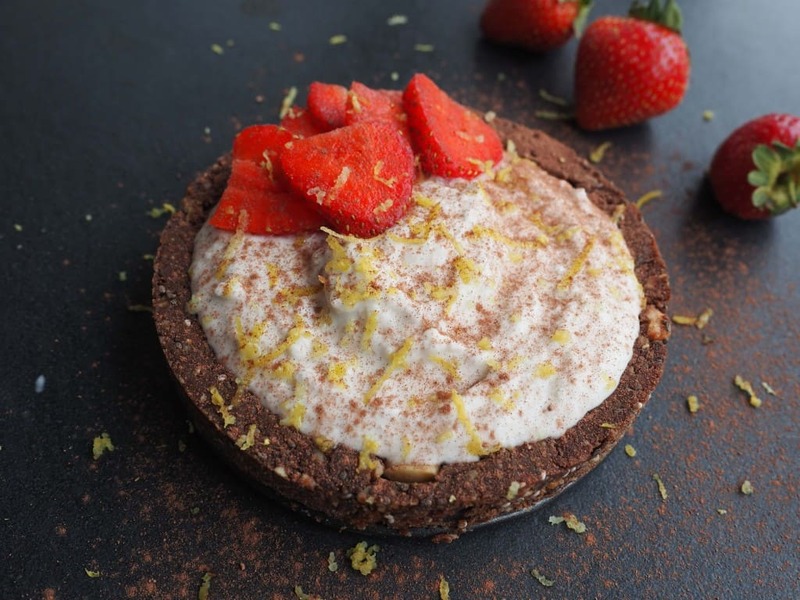 With Valentines Day this Sunday I thought I’d share a great little tart with you which is super easy, packed full of nutrients and YUM….and will keep your partner happy! Start by placing the cans of coconut cream in the freezer. To make the base combine all the ingredients except the coconut cream and lemon. Process in a blender for 30-60 seconds or until fully combined. It wont matter if some of the nuts a still a bit chunky. Line a small tart tin with a little coconut oil and put the base mixture in the bottom and up the sides. Avoid having it too thick as it’s super dense and will overpower the tart – it’s a meal in itself! You can smooth it over with the back of a spoon and throw it in the fridge or freezer to chill. Remove the coconut cream from the freezer and separate the fatty cream from the water. In a mixing bowl, combine the zest and juice with the coconut cream. Fill the tart casing with the lemon-infused cream and top with some berries and a dusting of cocao.